Sri Lankan cuisine has influences from colonial powers, foreign traders, and the Kerala region of India. Key ingredients are rice, coconut, and especially spices, reflecting the island's history as a spice producer and trading post over several centuries. 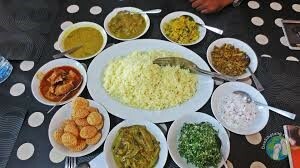 Sri Lankan cuisine centers around boiled or steamed rice served with a curry of fish, chicken, beef, mutton or goat, along with other curries made with vegetables, lentils, or fruit. 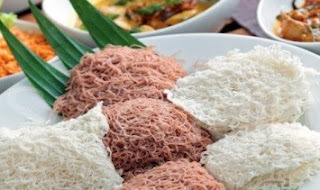 Dishes are accompanied by pickled fruit or vegetables, chutneys and sambals, especially coconut sambol, a paste of ground coconut mixed with chili peppers, dried Maldives fish, and lime juice. Sri Lankan cuisine plays a vital role in the islanders’ lives from the most auspicious Sinhala/Hindu New Year to normal day-to-day practices. They make milk rice and special sweets with coconut milk, flour, and honey at cultural festivals. 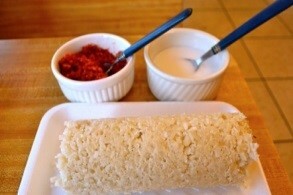 Milk rice, or Kiribath, is a traditional Sri Lankan dish made from rice. It is a popular festive dish for any auspicious moment. The dish is prepared by cooking rice with coconut milk, hence the name. The recipe for Kiribath is fairly simple. 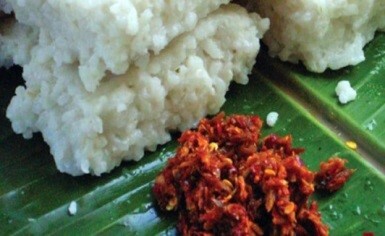 Rice is the staple food of the Sri Lankans. 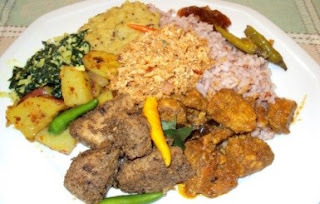 Almost every household in Sri Lanka takes rice and curry as its main meal. Meat, fish, and vegetables are prepared as curries. Sliced onions, green chilies, black pepper, cinnamon, cardamom, cloves, nutmeg, and saffron are used to add flavors. A basic rice and curry requires one fish (or beef or chicken) curry, two different vegetables, one portion of fried crispy stuff like “papadam,” a “mallum” of chopped leaves and coconut, and a gravy or “hodda” of spices and cooked with coconut milk. There are various types of Hoppers in Sri Lanka. Plain hoppers, egg hoppers, milk hoppers, honey hoppers, and string hoppers. String hoppers are made from rice noodles curled into flat spirals. It is served for breakfast and dinner with a thin fish or chicken curry, containing only one or two pieces of meat, a dhal dish, and a spicy sambol or fresh chutney. 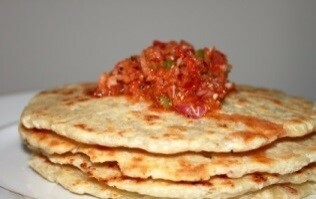 Roti is a quick meal and easy to prepare. Wheat, rice, or kurakkan (Eleusine coracana, a strongly-flavored brown millet) is a meal mixed with fresh-grated coconut and a touch of oil and baked on a hot griddle in thin flat cakes. 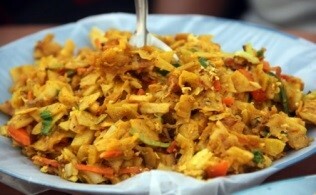 Kothu roti is made from Gothamba roti and vegetables, eggs, or meat, and various spices. 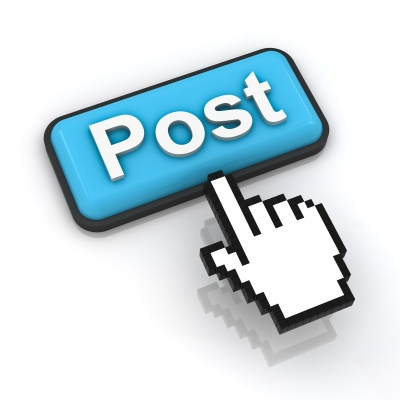 It is a delicious meal generally eaten at dinner time. Apart from the commonest form of Kothu with meat, eggs, or vegetables, a newer variety with cheese has been introduced. Pittu is a popular and frequently-prepared food item among Sri Lankans, with both Tamils living in northern and eastern parts of Sri Lanka as well as Sinhalese living in the rest of the areas of the country. 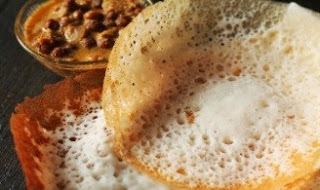 Traditionally, the main ingradient of “Pittu” is rice flour, but kurakkan flour or wheat flour also can be used. 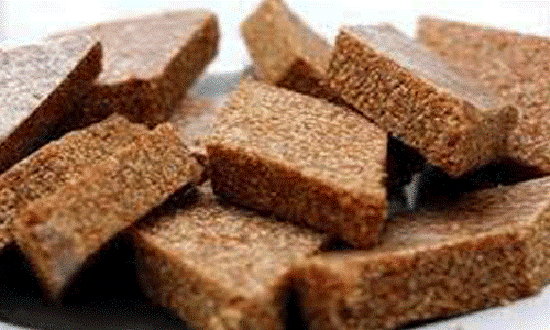 Mun Keum is a sweet food, especially in Sinhala and Tamil New Year Season in Sri Lanka. 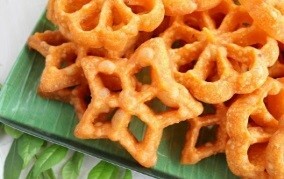 Kokis is a food, especially in Sinhala and Tamil New Year Season in Sri Lanka. Saw Dodol (Welithalapa) is a food, especially in Sinhala and Tamil New Year Season in Sri Lanka.